The handsome "Angel Fire" Holster features the traditional semi exposed trigger guard like all Mexican Loop holsters and is carefully tooled with the Santa Fe style tooled border and Angelfire Barbwire Rope Edge two tone conchos on the holster and gun belt. The holster rides on the fully lined Oldtimer Gun Belt which is clean with tooling only on the belt billets which are also adorned with the one inch round Angle fFre conchos. Buckle is the California Clipped Corner Nickle Buckle. The holster is hand molded wet and allowed to rest and dry to fit your gun model and promises a lifetime of smooth draws and holstering. SHARP! This rig features the unique Maker's Santa Fe Border tooling on the holster and belt billets otherwise the gun belt is not tooled. Secure fit, rolled throat for easy holster. The "Angel Fire" Holster and Gun Belt is perfectly suited for SASS Cowboy Action and Mounted Shooting and Western Reenactment. 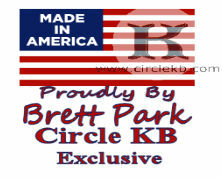 Featuring a 2-3/4" wide Old Timer straight, hand-cut belt with the fully lined hand molded holster riding on the belt. Gold barbwire trimmed silver conchos adorn the holster and gun belt. Hammer thongs are standard. Thigh ties are optional but not necessary (more for looks than function). Holsters are border tooled and belt billets are tooled. Belt is otherwise "clean" and not tooled at all. The Cowboy holster is one of our most popular Mexican Loop gun rigs among starting and more advanced cowboy action shoot.. 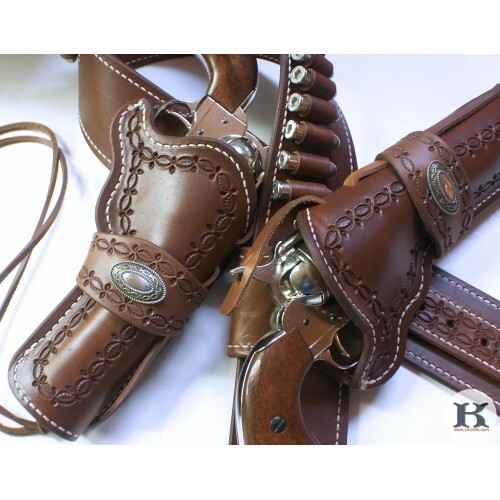 The Vaquero Mexican Loop Western Double Holster set is an authentic pattern of the Mexican Loop Holster, popular in the ..